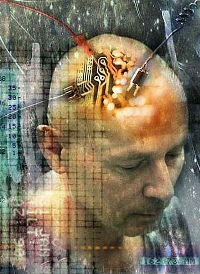 Would You Take Advantage of Brain Implant Enhancements? More than 80,000 Parkinson's sufferers have found relief using a deep brain stimulator, and brain electronics were implanted into Alzheimer's patients this year in hopes to slow down this insidious killer. Our brain is the source of everything that makes us human: language, creativity, rationality, emotion, communication, culture, and politics. Now, researchers are set to repair brain functions, to create mind-machine interfaces, and enhance human mental capacities in radical ways. Today we enjoy basic conversations with our smartphone, desktop PC, games console, TV and, soon, our car; but voice recognition, many believe, should not be viewed as an endgame technology. Although directing electronics with voice and gestures may be considered state-of-the-art today, we will soon be controlling entertainment and communications equipment not by talking or waving; but just by thinking! Forget Siri, if future-thinking researchers have their way, your brain could soon be chatting away on the phone. A new implant developed by UC-Berkeley neuroscientist, Robert Knight, could create a game-changing relationship between you and your machines. You may soon be able to transmit thoughts via the Internet using a translator chip implanted in the brain that converts thoughts into synthesized words.